We’re on the cusp of a New Year! What will it bring? A quick spin through Google reveals all sorts of prognostications – some funny, some serious, some terrifying. But here’s one thing we can know for sure: When our trust is in the Lord, we can live lives marked by confidence and joy rather than worry and fear, no matter what the future holds! 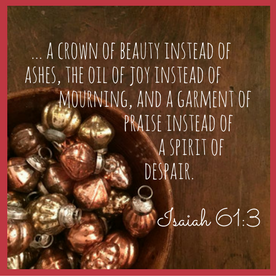 When I heard this little nugget of Christmas gift-giving wisdom from my friend Natalie (her mother-in-law likes to hit all four categories), I liked it. And I decided to use it as a bar against which I could measure the stocking stuffers I’d found for the men in my life. Something you want? Golf balls and surf wax. Check. Something you need? Razors and (because airport security has all of ours) pocket knives. Check. Something to wear? Socks and boxer shorts. Because Christmas. Check. Something to read? The Surfer’s Journal. And (because I am trying to drum up family interest in a visit to the Holy Land) a magazine featuring the spectacular vineyards of Israel. Check and check. Having covered all the key bases, I was ready for Christmas morning. Still, though, something was missing. I hadn’t yet found the perfect “one-size-fits-all” gift, the annual follow-up to presents like The Posture Brace of 2013 (which was advertised as being “virtually invisible” under clothing but wasn’t, but which, looking back, had the unexpected upside of checking two boxes, since it was both something you wear and something you need). Rick Warren’s Bible Study Methods. 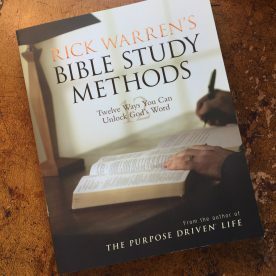 Rick Warren (the guy who gave us The Purpose Driven Life) knows that Bible study can be tricky. We don’t do it, he says, because we don’t really know how (nobody ever taught us), we’re not motivated (we haven’t yet experienced the joy of discovery), or maybe because we are just plain lazy (ouch). Warren’s goal is to get us over all three of these hurdles and help us find an approach to Bible reading that works – specifically and personally – for us. To that end, he offers 12 different methods we can try, along with step-by-step instructions for each. Twelve different ways to study the Bible? I figured at least one of ’em would appeal to my guys. Now before you go telling me that they would have rather had more golf balls, consider the categories. This gift was something that they could read. And need (because who among us couldn’t use a little professional help when it comes to Bible study?). 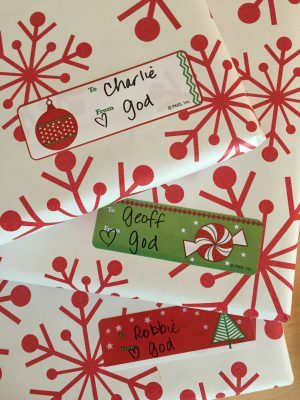 They couldn’t wear the book, obviously, but since one of our favorite uncles starts most of his mornings by looking at his wife and saying, “Tell me what I want to do,” I figured that maybe I could tell Robbie, Geoff, Charlie, and Robbie Jr. what they really wanted in their stocking. Read, need, and want. Three out of four. Brilliant. And, just to be sure that the fellas appreciated what a good gift this was, I tweaked the wrapping. Any old Santa can give you a razor. But a book designed to help you grow in your understanding of Scripture? And second, I make a Bible reading plan. 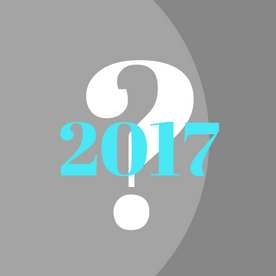 (I’ve written about this one before; click here to see last year’s ideas.) I figure that if I want to get to know God better (and I do), then I can’t just rely on my heart. I need to engage my head. I want to get to know God through the Bible, digging deep to unearth its riches – and letting them transform me. I want to get to the end of the year and say, “I grew. I got to know God better. I fell even more in love with him. Do my guys want that too? I don’t know; I pray that they do. I pray that all of us do. And if you’ve got your own favorite reading plans or study methods, I’d love to hear about them. Why not post a comment for others who might want to try what you like? There is not, obviously, any “right” way to read scripture; the key is mainly to grow in our faith, to fall deeper in love with our Heavenly Father, and to be equipped for whatever he has in store. Because there’s a whole new year out there, just waiting for us to unwrap it. String the lights, sing the songs, wrap the gifts…we have a REASON to rejoice! May we glorify you as our Lord and rejoice in you as our Savior this Christmas! It was a day, in other words, not unlike May 21, 2016. We were in Charlottesville then, celebrating Virginia’s U.Va. graduation. Rarely have I been so happy to have my parka and my hat. And my boots, which I bet I could have sold for a few hundred bucks (and which I did, in fact, loan to another mother whose daughter’s ceremony was after ours). Which is fitting, actually. 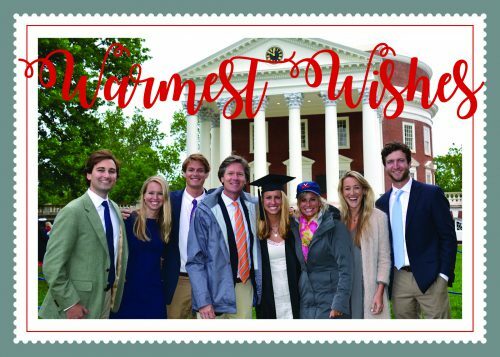 Not because it might as well have been snowing on Jefferson’s Lawn (and I promise you, I think I really did feel some sleet), but because of the joy – and the warmth – that Christmas always brings. When the nephew enters Scrooge’s office, he is “all in a glow.” He has a ruddy face, sparkling eyes, and breath you can see, like smoke. Eavesdropping as the young man catalogs the virtues of Christmas and all the good that it does, the clerk (who is in the next office, freezing) can’t help himself. He applauds. I love it because we do the same thing that Scrooge’s nephew did, when we say, “Merry Christmas!” to one another. We warm each other’s hearts with those simple, yet powerful, words. You don’t have to hate the cold as much as I do to know that Christmas changes everything. And you don’t have to be like the clerk to applaud. Happily, the answer is yes. And for us, the promise is this: God brings life out of things (like stumps) that appear to be dead. 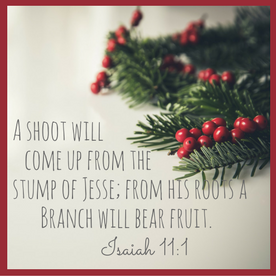 The Root of Jesse is Jesus, the one who offers us joy, peace, and hope. Can there be any better Christmas prayer? I’m praying Romans 15:13 for you, and for your families, today! So Buddy the Elf has been at it again. 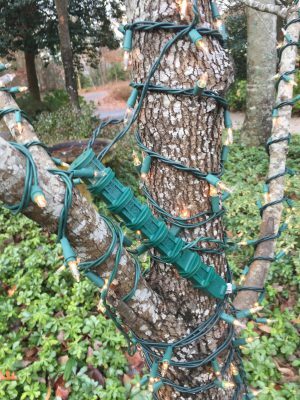 He got inspired when we went to Dallas (where they are, evidently, as serious about their Christmas lights as they are about their hair). No sooner had we gotten home than Buddy was off to the hardware store, where he picked up a couple million more strands. Buddy also came home with a few boxes of something called the “Net of Life.” I think that name is a little bit misleading, like maybe it should be a sermon or something. Plus, there a lady on the package who, presumably, hung a bunch of lights on her snowy roof. We know she didn’t. She isn’t even wearing a coat. But whatever. The Nets (which I bet the Dallas people do not use) did the job on our bushes, and then Buddy got out the ladder and started climbing the trees. If he wanted help, he didn’t say so. 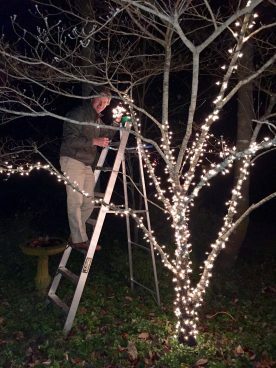 I imagine that he (like most husbands) is pretty much happy to be out of the house – out of earshot – this time of the year. My man worked for most of the day, adding strand upon strand. Anyhow, when when darkness finally came, Buddy was ready. And when he plugged ’em all in, I loved it. Because I’m no fan of winter. Or cold. Or darkness. Or anything, actually, that feels like Not Summer. 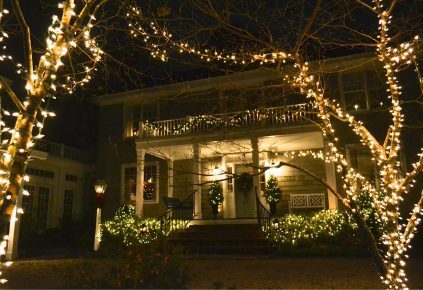 But Christmas lights have a way of making the brrrr go away, and of filling our hearts with hope. The light has dawned. The light has dawned! Come January, when it’s time to take down the sparkle, we can hang our hope on that. Because we may pack up the Net of Life…but the Light of Life will still shine. Bhahahaha! Hours after this blog originally posted, you began alerting me to the fact that I’d read the box wrong. Even my mother weighed in, bursting through the door of our home and saying, “Jodie! It is not life. It is lite!” Ahhhh! That makes so much more sense! 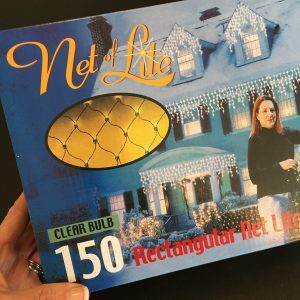 I couldn’t figure out why someone would market a Christmas decoration as the “Net of Life.” Obviously, my eyes are old. In my defense, though, I don’t think people should be spelling LIGHT like LITE. “Lite” is for diets. Which Christmas is not. Christmas is all about the FULLNESS of joy. And my prayer, for you and for me, is that we will experience Jesus as the light of life…the bread of of life..and yes, even as the Net of Life – one that is big enough to cover us all! I love the book of Isaiah. 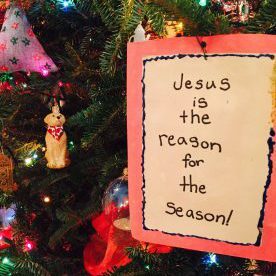 Especially now, at Christmastime, when so many of the prophet’s words point to the hope that Jesus brings. He is the Wonderful Counselor and the Prince of Peace. He’s the one who binds up the brokenhearted and sets the prisoner free. He is the one whose coming is the glad tidings – the good news – our hearts are yearning to hear. And he’s the God who changes things. You can’t really tell from this photo, but Joseph is rocking a man bun. Mary’s drinking what looks like Starbucks (while showcasing her cheekbones for the selfie). 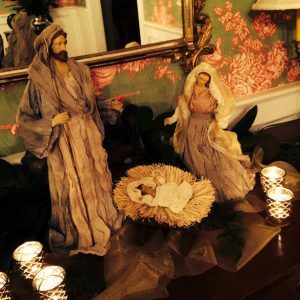 And the baby Jesus is swaddled in what has to be some sort of handmade, organic-yarn blanket and beanie. 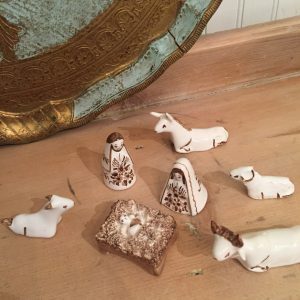 The set also features three hipster wise men (who come bearing gifts a la Amazon Prime), a couple of well-fed animals (the cow’s trough is marked “gluten free”), and a teenaged shepherd boy who’s posting the whole thing on Instagram (#babyjesus #nofilter). Theologically speaking, I’m not really sure what the designers had in mind when they came up with this scene. But honestly? I kind of like it. It makes me feel like the whole scene is kind of…relevant. Like Jesus really is what Hebrews 13:8 says he is: the same yesterday, today, and forever. He is as present in the lives of selfie-taking, latte-drinking, man bun-wearing people as he was in the lives of the folks who gathered around him 2,000 years ago. 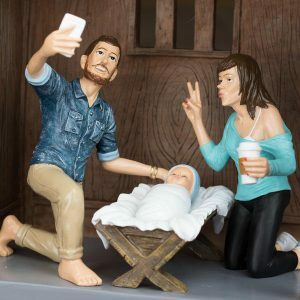 And I don’t blame Millennial Joseph and Mary for wanting a pic with the Lord. Had I been in their TOMS, I would have taken one, too. I’ve always thought it would have been pretty cool to be alive when Jesus was walking and talking and telling people where the good fishing was. Sometimes, I’ve even been jealous of those first disciples and all the others who literally saw him do miracles, and who could ask him hard questions, face to face. From an evangelistic standpoint, it feels like it must have been a whole lot easier to bring people to a living, breathing Jesus and say, “Look. That’s him. He fed all those people.” than it is to convince them to entrust their lives to someone they can’t even see. But here’s the thing. Mary and Joseph and all of those early Christians got to see and experience all sorts of neat stuff. But when the time came for Jesus to be crucified, he told his followers that it was “for your good that I am going away.” Why? Because that meant that the Holy Spirit would come. As a man, Jesus knew that he could only be in one place at a time; as a Spirit, he is able to be with all of us, everywhere, all the time. So yeah, I would liked to have been at the manger. I would like to have heard the angels sing, and seen the look on the wise men’s faces when they finally got to the stall. I would like to have pulled Mary aside and asked her all sorts of questions. 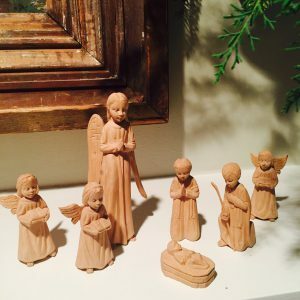 I would like to have thanked Joseph for believing the angel (and for staying). I would like to have held the baby. I would like to have watched him grow up. But when I think about the Holy Spirit – his omnipresence, and all of the wisdom, comfort, conviction, guidance, and strength he provides – I am pretty darn glad to have that. To have him. 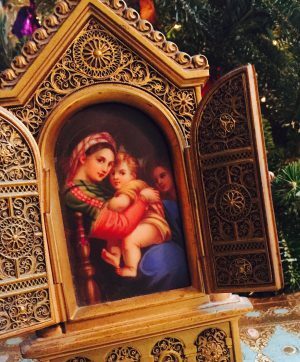 And this Christmas, as I read verses like Luke 11:13 (which says that if we know how to give good gifts to our kids, how much more will God give the Holy Spirit to us), all I can do is ask God for more of the Spirit’s work in my life, and thank him for the indescribable gift of his presence. So again, yeah. I would like to have known Jesus on earth. Mary, too. But you know what? I figure I’ll meet her one day, and (like all mothers, I guess) she’ll probably still be happy to talk about what her boy was like, as a child. I look forward to hearing her stories. 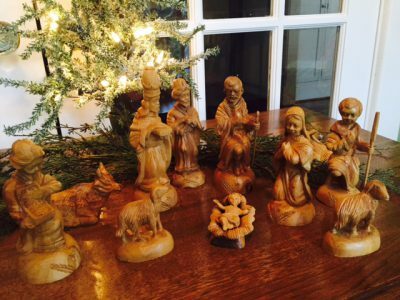 Christmas is upon us…which means we are stacking our desire for “peace on earth” against the chaos of too-busy schedules, relationship challenges, and a barrage of advertisements and emails that seem anything but peaceful (23 shopping days left!!). If you find yourself taking deep breaths and longing for the peace that Jesus brings, you’re not alone. In fact, Paul closed one of his letters with that very prayer, one where he asked God for continual peace in every circumstance. 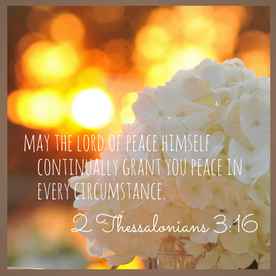 Continual peace? In every circumstance? Yes. Yes, please!